Posted November 8, 2016 by Seán Kinane & filed under Elections, News and Public Affairs, Voting Rights. A man in East Tampa almost gave up before voting this morning after being told he wasn’t on the rolls; after more than an hour, Virgil Campbell was able to update his address and vote at the Fair Oaks Park Community Center in East Tampa. “I went in there the first time and they were telling me that I wasn’t in the system. I showed them a voter’s registration card. I showed them my I.D. and they was telling me that I was not to cast a ballot here in Hillsborough county because I was in Pasco County. But, I said no, I’ve never been to Pasco County. “So, they sent me out of the center, I couldn’t vote. So, I came back and then the lady, right here, she stopped me and told me she checked to see if I was a registered voter and I was, but, it was in Pasco County. But, I told her my sister changed my address with her, when she moved. So, I said I’ve never been to Pasco County, but, my mailing address was changed back here. And you were about ready to give up until you got help? So, how does it feel to vote? And finally, do you want to tell anybody who you voted for or why? Laila Abdelaziz works with the Council on American-Islamic Relations of Florida. She’s also a board member at WMNF. Today she’s part of a voter protection effort in Hillsborough County. “Well, we have noticed a couple of themes. You know, we noticed people that come up to vote, that aren’t registered to vote, obviously, we have to turn them away. But, we did have an individual, a gentleman today, that was eligible and registered, but, he just had to do a simple address change. “I think it’s really important for people to know that, on election day, if you are eligible to vote and if you are registered to vote and just simply did not update your address, you can do that on election day and you can still cast your regular ballot. What someone should do if they’ve moved, is go to the precinct, where they live now and just do a same day change of address and that’s completely fine? Even if the poll worker tells you that’s not fine, you just be persistent and maybe call the Supervisor of Elections? The voter protection hotline is 813-229-4286. The Hillsborough Supervisor of Elections, Craig Latimer, says that as of noon Tuesday, voting was robust. “So, we’ve already had 87,000 people have voted, so far today, on election day in the first 5 hours. We actually voted 24,000 voters in the first hour. Out of a total of about how many? Have you heard of any major issues this morning in Hillsborough? 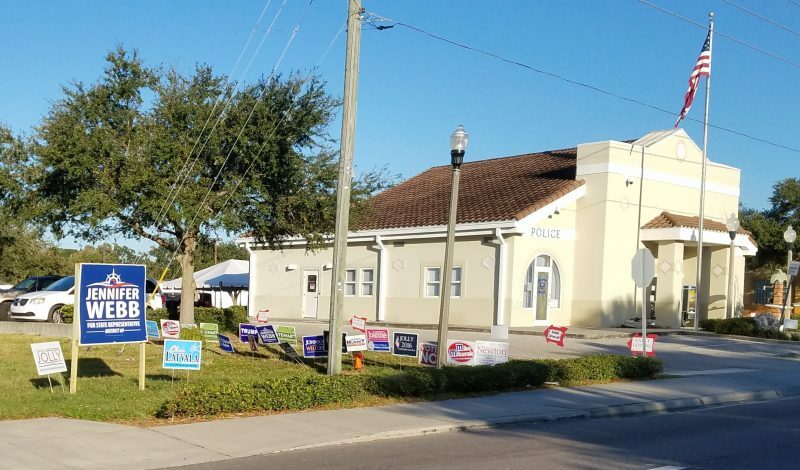 I spoke with a gentleman in east Tampa, who was originally told he couldn’t vote, but, after a call to your office, I believe, it was recommended that he update his address and then he was able to vote. What would you recommend to people if they’re told they’re not on the voter rolls? What are some things they can check for? “Yeah, Sean. I saw that video and I gotta tell you, at first, there, I thought it was an episode of ‘Who’s on First?’ Because the gentleman, you know they said our records show you’re in Pasco County and he just wanted to argue that he had never lived in Pasco County and then ultimately he found out his daughter or somebody, changed their address to Pasco County and there was a lot of confusion there. “But, if somebody goes into a site and they can change their address– you can change your address, on election day, at a polling site. So, make sure you’re in the right polling site. But, at most, you should vote a provisional ballot and then we can get it straightened out, when we get it back here. “Provisional ballots are not bad. Provisional ballots are good. They actually enfranchise a voter, they don’t disenfranchise them. What happens if you vote a provisional ballot and you happen to be in the wrong precinct when you do that? And so you’re ballot might be a little bit different than where you were supposed to have voted? So, make sure you vote where you live.